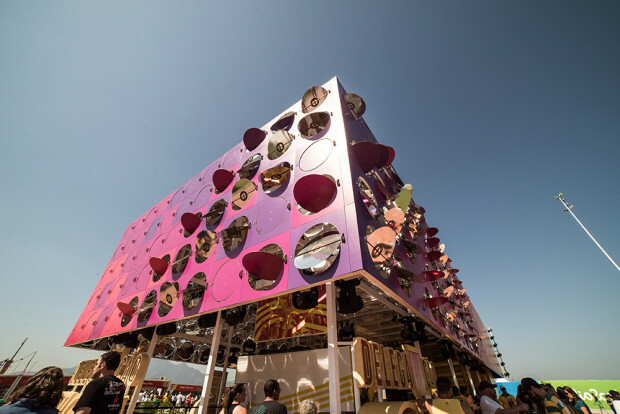 The Dancing Pavilion is a temporary Interactive Architecture created for the Olympic Park 2016. Scattered sensors inside of the dance floor capture the beat of the music and the movement of people dancing, which activates the motors of the mirrors on the façade of the building. 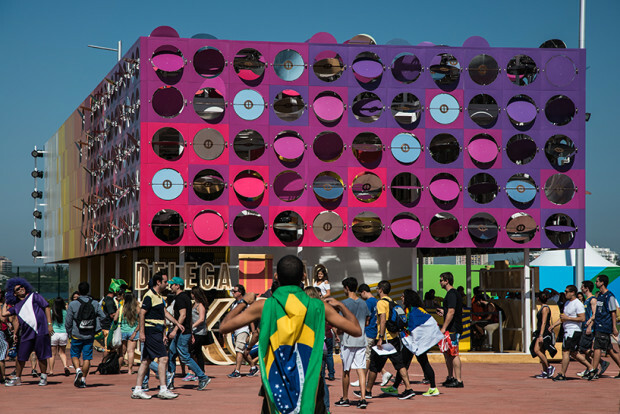 The result is a kinetic architecture that hypnotizes people, and transforms the space into the most exciting dance club of the 2016 Olympics. Scattered sensors inside of the dance floor allow the skin to react to stimulations, such as the beat of the music or the excited commotion of people. This Interactive Architecture is made with around 500 round mirrors that spin, opening and closing, creating optic effects. 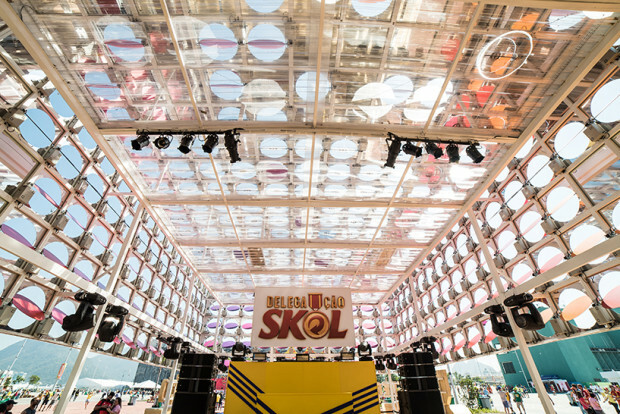 Under the sun, this kinetic pavilion creates graphics with light and shadow on the floor and its surroundings. At night, light cannons dramatically cast an explosive light outside, calling attention as far as the entrance of the Olympic Park. 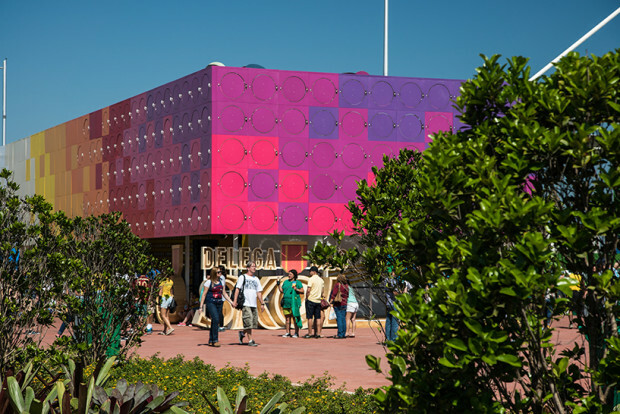 As emotional architecture, it shivers like an excited body. 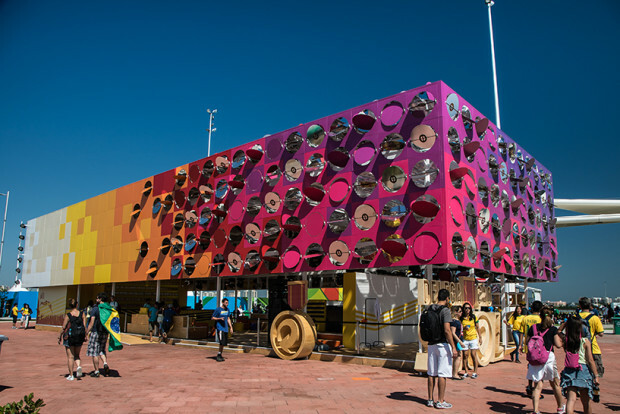 To create this experience of design and technology, we wanted to provoke the visitors of the largest sporting event on the planet. We wanted to take them from a common place, to stimulate the athlete that exists in everyone, and bring them to a dream state of joy and escapism.The hardware and software necessary to give life to the skin were developed by D3, a producer of interactive installations that work in the intersection of technology, design, and poetry. This temporary project is an outcome of a research process that Estudio Guto Requena has been developing for the past 10 years, investigating hybrid architecture, weaving together our concrete and virtual worlds, using sensors and interactive technology to transform our perception of space and sharpen our sensoriality.